After learning a tough lesson in their opening game of the season, the Calgary Roughnecks have reeled off a trio of triumphs. 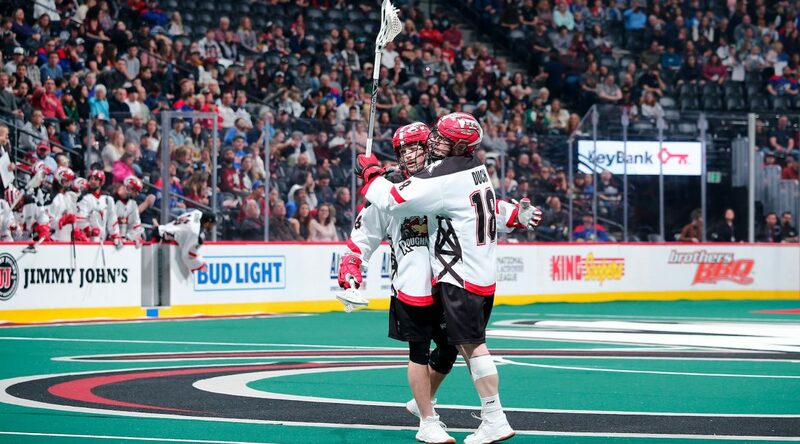 Following an 11-8 win over the Colorado Mammoth at Denver’s Pepsi Center on Sunday afternoon, the Roughnecks (3-1) have now held opponents to less than 10 goals in three straight games. Rhys Duch led the way offensively for the Riggers with four goals and two assists, while Del Bianco stopped 41 of 49 shots he faced to backstop Calgary to victory. In addition to praising Del Bianco, MacRae said one of the keys to Calgary’s three-game winning streak has been the commitment to playing hard right to the final buzzer, which is something they didn’t do when they gave up a five-goal lead and lost 14-13 in overtime to the Vancouver Warriors in their home opener on Dec. 15. “After our first game against Vancouver, when we let the game slip away there, we’ve been really pressing the 60-minute battle,” MacRae said. “We find if we just keep to our game plan, just keep pounding them for 60 minutes, and things are going to go our way. I thought that’s what happened today. Dan Taylor scored twice and set up two others for Calgary, while Chris Boushy, Riley Loewen, Zach Currier and Shane Simpson each had a goal and two assists for the ’Necks. Ryan Martel also scored a key goal in the third quarter and had an assist. Playing in just his second NLL game, Simpson recorded his first two assists before scoring into an empty net for his first goal to seal the victory for the Riggers. Ryan Benesch led the Mammoth attack with two goals and one assist, while Taylor Stuart, Ryan Lee, Chris Wardle, Stephen Keogh, Eli McLaughlin and Brad Self also scored. Colorado netminder Dillon Ward did his best to keep his team in the game by making 28 saves. Shortly after Del Bianco stopped a breakaway attempt by Joey Cupido five minutes into the game, Duch opened the scoring for Calgary when he snapped a shot past Ward. Stuart wired a shot into the top corner over Del Bianco’s right shoulder at 7:55 before Duch scored his second of the game at 9:37 to put the visitors back up by a goal. During a lengthy two-man advantage for the Mammoth, Del Bianco stood his ground to make a big stop on McLaughlin from point-blank range late in opening quarter. After McLaughlin scored to pull Colorado even at 5:34 of the second quarter, Boushy whipped a low shot past Ward at 7:16 during a man advantage for the Riggers. The Mammoth responded right back with goals by Lee and Benesch 18 seconds apart before Taylor took a behind-the-back pass from Martel and snapped a quick shot past Ward at 10:02 to even the score at 4-4. The see-saw battle continued as Duch converted his breakaway attempt after hauling in a long-range pass from Del Bianco at 12:48 before Benesch answered right back with a breakaway goal of his own with 1:17 to play in the first half. The ’Necks started quickly in the second half thanks to goals by Loewen and Martel before Keogh fired a shot through traffic past Del Bianco. Duch then converted a nice feed from Boushy for his fourth of the game before Wardle responded right back for Colorado. Currier scored a key goal in transition at 9:32 of the third quarter when he picked the short side behind Ward while running into the Colorado zone. Taylor cut hard to the net and snapped a shot past Ward while falling to the floor to put the Riggers up 10-7 at 5:18 of the final frame. The Mammoth pressed hard to get back in the game and were rewarded when Self fired a shot into the top corner behind Del Bianco at 8:08, but that’s as close as they could get. Next up, the Roughnecks will return home to the Scotiabank Saddledome to host the New England Black Wolves next Saturday (7 p.m.). However why did you take your foot off the gas when up by 2 goals with about 9 minutes to go in the game? The offense stopped playing and “slow-it-down” Dobbie stalled every bit of momentum we had leading to another Colorado goal. Without Dobbie our offense is much faster. Luckily we pulled off an empty netter to seal the deal.